This post is another guest post by Twitter user Keith, aka @webdivemaster. This post is Keith's Commentary. Science Fiction used to be a great hallmark for television viewers in one form or another, but in recent times has seen a steady decline in quality and durability in the markets, making it seem as though the purer form of the genre has been buried at last. Only 5 years ago one could see many of the best and worst of Science Fiction over the span of months, to include the likes of many of the best classics. The Star Trek universe has so much to offer, but now one is lucky to see anything other than ST:The Next Generation on (available all over cable, such as local syndication, BBC-America, WGN-America, and SyFy). Sure, ST:Voyager is on Spike at 2-3 Eastern, but their programmers can't slot shows correctly, so if you try setting a DVR to catch it you get the tail of the preceding program for anywhere from 1 to 40 minutes, and then see Voyager minus the ending 1 to 40 minutes correspondingly. ST:The Original Series is rarely seen, even on SyFy, and ST:Deep Space Nine is the ugly runt of the litter evidently, as it has no real showings on USA cable at all. ST:Enterprise is seen on some weekdays on SyFy, but only when they aren't doing 'a full day of horror movies' or 'a full day of Stephen King' or other some such. The list of classics that are no longer seen on sets is lengthy: Firefly, Farscape, Andromeda, Babylon 5, Crusade, Battle Star Gallactica (any version), Earth Final Conflict, Buck Rogers, Space 1999, Lost in Space, Alien Nation, Roswell, Voyage to the Bottom of the Sea, Quantum Leap, V (orig), Flash Gordon (both), Logan's Run, Sliders, Time Tunnel, Space Above & Beyond, Lexx, Red Dwarf, Blake's 7, Seaquest DSV, Invasion, John Doe, Pretender, Seven Days, Timecop, Threshold, T:Sarah Connor Chronicles, Charlie Jade, Max Headroom, Odyssey 5, and so many others... None of these has been on broadcast for ages, but a majority had been on the beloved Sci-Fi in rotations long ago, if not but once a year. Then there is the more Fantasy section of Science Fiction, often lumped into the genre though it is a separate entity unto itself, as is Horror, or Drama. But many wish to pile shows with superheroes in the SF file as it is just easy, these being shows like: Hercules, Highlander, Superman, Wonder Woman, Xena, Kolchak, Moonlight, Greatest American Hero, Wild Wild West, Man From UNCLE, Lois & Clark, Batman, Bionic Woman, Early Edition, Six Million Dollar Man, Avengers, Buffy, Dark Angel, La Femme Nikita, Roar, Beastmaster, X Files, and so many more... Again, most not having been seen on cable in years, but the majority had been in the rotation for one of the 260 weekday 8-4 mini-marathons that Sci-Fi did. Caprica has none of the action, grit, and well written scripting of it's parent show BSG. It is instead a bad soap in the BSG universe with an EMO-teen angst-Robot / sometimes Avatar with stories that lead somewhere, and we know where, but this path is looking very tortuous. I wrote from the beginning when the pilot was released that they were doing the BSG saga a dirty deal, and they should dump that line for one set 10-12 years ahead, with a young Adama getting into the Academy, dealing with the conflicts of Military life, being one in amongst many and trying to make one's self stand out, the dealings with people from the other colonies, Flight training, and the rise of the Cylons to their imminent war. The other problem was SyFy's scheduling, but with Caprica coming back in October, but a decision due for renewal vs. cancellation in November, it will need a significant following for any life past 26 episodes. So, what on currently is worthy for Science Fiction viewers? Eureka has had it's moments, but the story arcs seem to have been going off on bad tangents of late. Warehouse 13 seems to be doing well for itself, and should hold in for a little while longer, as long as it does not get into a 'cookie cutter' scripting mode, i.e. : same story week to week, just a different artifact for flavor. Sanctuary is returning as well in October, and should prove to be another good season, and get the nod for further episodes. The story lines have had a good long term arc to them, while the individual episodes have been well done and unique. Haven seems to be well done, but is dragging out the punch line like an old man who seeds so much flotsam into the story that by the time one gets to the meat of the real story, one has forgotten what they were talking about to begin with. Sure, she deals with every week's new creature all fine and dandy, but anyone else in that situation would be a bit more persistent on the trail of why she is there to begin with, being ?Mom? SG:Universe is anticipated to be an improvement over the starting season, as even in the later ten episodes of the first 20 episode season, there had been a marked improvement of writing and acting. One can only hope that the lag time between episodes 10 and 11 is kept at about 3 months unlike the 4 last year, or what should have been 9 months between eps 9 and 10 of the first seasons 17 (18 with the pilot). Star Wars: The Clone Wars - The best adult drawing cartoon in the Science Fiction genre on (yeah, Futurama is notable, but more of a spoof/comedy) and worthy of viewing. The Lucas guys have been doing this well. After the first trial of a season and a half, now it is in it's 3rd season of 22 episodes, and promises to be just as good if not better than it's past seasons. V - returning, and hopefully not just to be cancelled. NBC killed this one last year with the break for the Olympics, and also waffling over renewal. It actually did get off 12 episodes though for a first season, and had great numbers for it's premier last year, but fell off steadily after that. Fringe - will continue, and looks like it is doing well with it's writing and acting. Being Human / Torchwood - BBC America is still doing both series, and we Yanks had to see if we could do them better/cheaper/worse than the Brits, so soon we will see if 'The Office' stands as the only Brit show to be adapted AND accepted in the US, or if they go the way of everything before and die horribly. Doctor Who / Primeval - If nothing else, BBC is worth the cable for these alone, even if you don't catch the other stuff there. Doctor Who has a Christmas special, and hopefully the next season starts March/April (no word yet). So... Where has all the Science Fiction gone? Netflix and DVD basically. If one wants to view the classics any more, it is ones best interest to get a gaming system, or cheaper still a Blu-Ray player capable of interfacing with Netflix, and becoming your own programmer. Cancel the cable if you wish, as the plethora of proven stuff is better than most of the newer stuff being tossed onto the airwaves. So, Science Fiction is probably not dead, but until a channel is created to showcase the Classics of SF we are stuck with very few hours of real SF viewing as compared to the 'Way it Was' when Sci-Fi was doing the classics. One asks 'why stop'? Simply, the almighty dollar. It cost too much to keep a great variety of classic and favorite shows in their broadcasting 'inventory', and we are then bombarded with the cheapest stuff that could be thrown on the shelf for movies, daytime, and other viewing. Even the SG's are shunned off from the daily mini's, not being seen as often as they once were there. Instead, the invasion of wrestling (increasing from one hour a week to sometimes 3? ), and the abundance of pseudo-science and horror have overrun the network, but they believe that is what people want. Sorry, but there is what I believe is a silent majority just wishing things could change back to the way that they were if only some. Every other channel has jumped on the Ghost-garbage bandwagon, and it is sad. So, let Travel channel, and all the others have the ghost stuff finally, as they are more a tourist attraction to those who wish to believe in those fairy tales and unfounded. Gates and his "I conned SyFy into paying me tons of $$ to go look for stuff that doesn't exist" show belongs there as well, being more travelogue than anything else. Heck, if he got a chef to travel with him and talk about their meals, they could do the Food network too! As for the horror overabundance, well, that is just a simple bit of territoriality. SyFy should be the prime place for Science Fiction, not horror. One asks then where can one get their dose of horror from? Simple, as NBC-Uni also has the Chiller network, dedicated to horror, and there is also Fear-net. Basically, SyFy has helped kill the genre, if only by not keeping the classics alive and in view. I know myself I would not have ever seen the likes of Charlie Jade, Roar, or Odyssey 5 if it had not been for Sci-Fi, plus other series I had not seen in ages were suddenly brought to life again. Can Science Fiction survive without it's past offerings? I think not, as with each new offering, so many have lost the ideals of what Science Fiction has always stood for. Sure, we sometimes create robots and forget to put in Asimov's Three Laws of Robotics, and it goes awry, but the overabundance of horror (much of it bad to begin with) is definitely not in the best interest of SF. 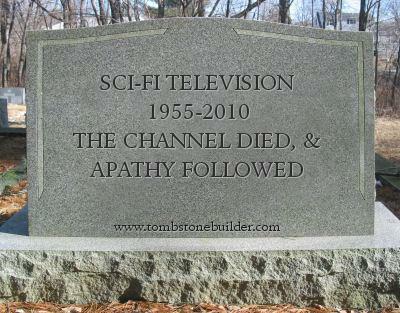 Yes, the genre is dying, and until SyFy can get back to embracing the classics, they will continue to be credited with at least digging the grave for it's final imminent death. Silly argument. They don't run old stuff because it's old stuff, just like other tv networks don't run howdy doody and leave it to beaver. i would like to see new sci-fi shows too but god charlie jade? slowest, worst show ever. Roar? Are you frakking kidding me? anytime i hear these "i just wish things were the they were back when" rants i just think the person who wrote it is a silly cultural luddite. Also ignores the issue of broadcast rights. Even if Syfy wanted to show, say, DEEP SPACE 9, they won't be able to do so until the channel that owns the rights (is it still TNT?) is willing to relinquish them. Networks can't just show whatever they want regardless of who owns it! At least the so-called original stuff syfy plays could be, well, good. Almost every movie they show anymore is a monster movie and it's usually the same plot with a different flavor. It's sad really. Maybe they can't afford good writers?